We all want to dive into the underwater world, at least once. The fishes living in nature, the stunning coral reefs, the white sand, the topographical features—the underwater world is truly a beautiful and mysterious place. Even those without a license can peek into the underwater world through trial diving lessons. 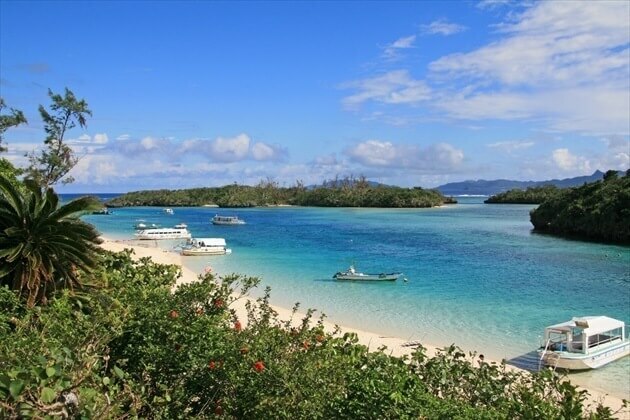 Get ready to be introduced to the charm of diving in Ishigaki Island. 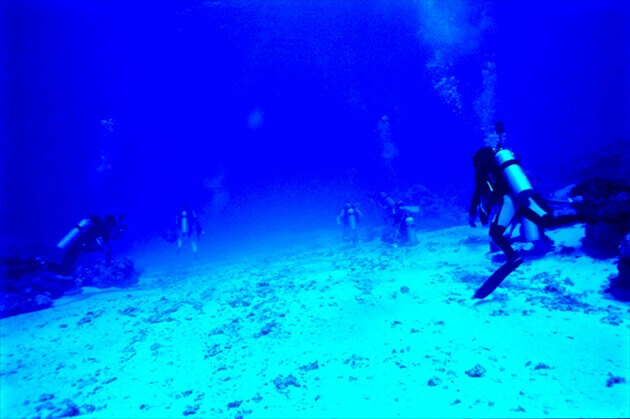 Wouldn’t you like to experience the fun of diving in a tropical island, at least once? 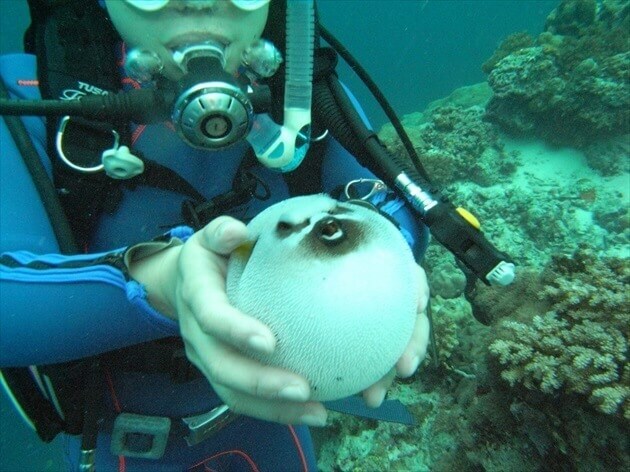 Ishigaki Island is one of the world’s best diving spots. 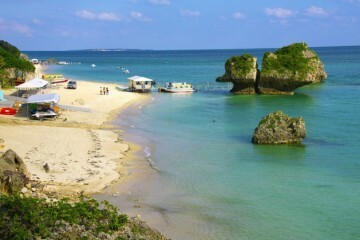 Being the center of the Yaeyama islands, it has the convenience of direct access from Tokyo by plane. 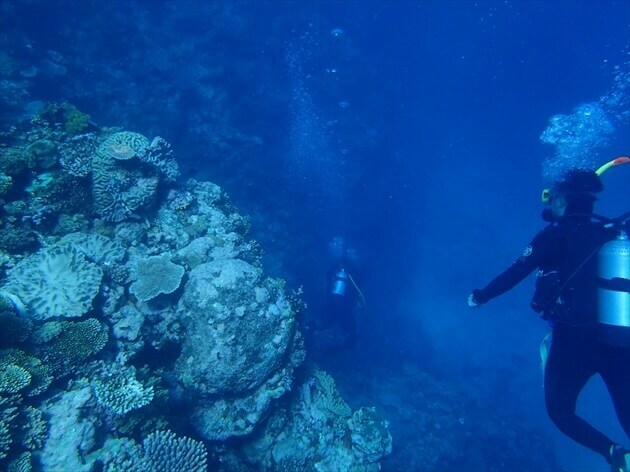 Just in Ishigaki Island, there are several diving spots, so you can dive in an area depending on your level. That’s one of its appeals. 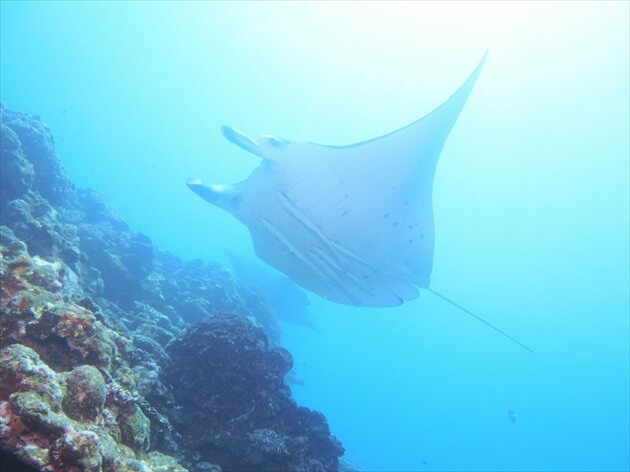 One of the reasons why Ishigaki Island is so popular for diving is that you can see colorful fish, big mantas and such, from up close. Moreover, the sea has very high visibility. 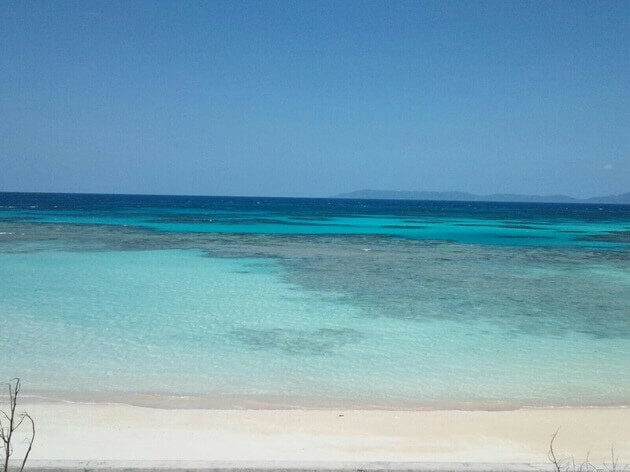 The reason why Ishigaki Island’s waters are so clean is because, within the island there are no big rivers, resulting in few excess sediments or impurities. A little does flow by, but they disappear quite fast due to the effect of typhoons and such. 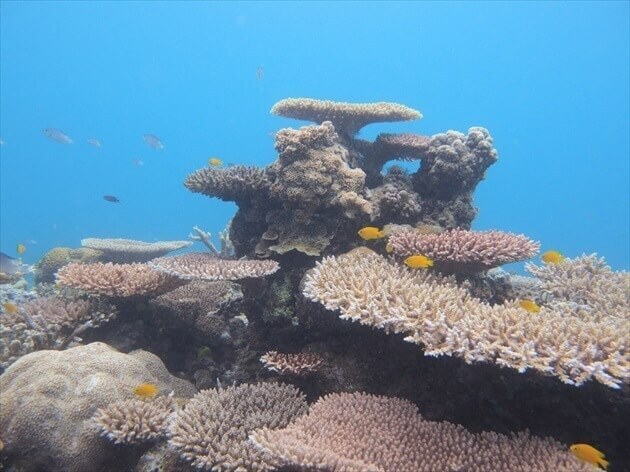 The water, with few impurities and exposed to a lot of sunlight, is an ideal environment for coral to grow. Because of this, the sea retains its beauty. If you dive underwater,a beautiful scenery will spread out; you will feel like you are looking through a glass pane in an aquarium. 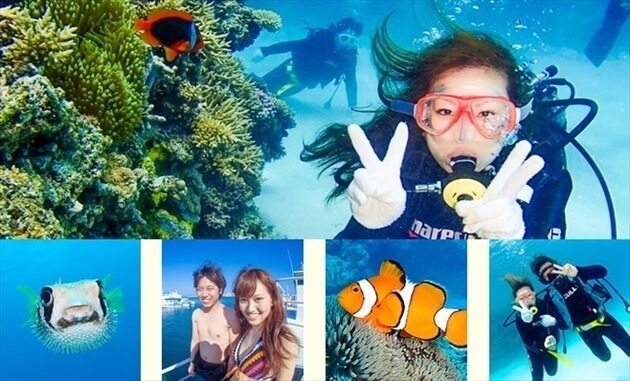 Another appeal of diving in Ishigaki Island is the pretty high possibility of meeting ‘big-shot’ sea creatures. 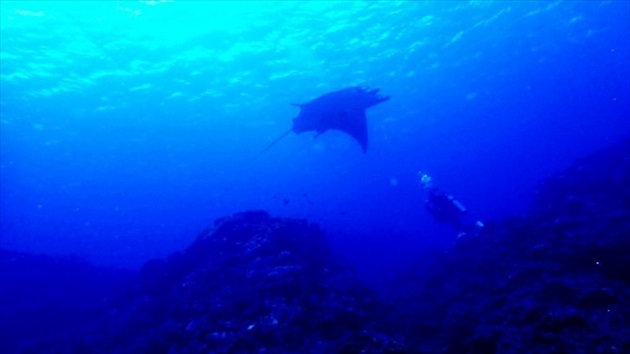 In Ishigaki, the manta ray is known to be a ‘big-shot’ creature. 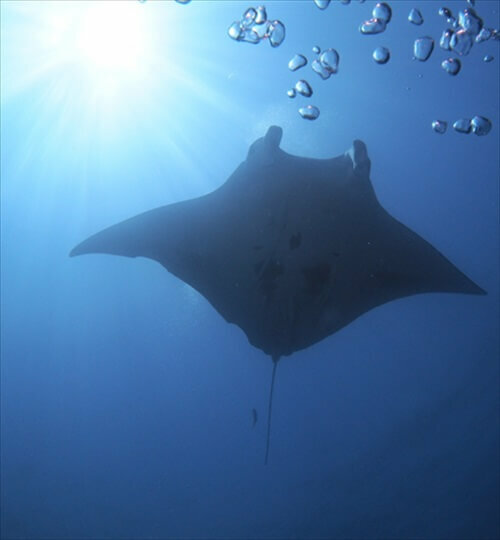 Depending on the season, you may encounter settings where you are surrounded by more than ten manta rays! This is an astounding encounter rate, for anywhere in the world. Just for the record, manta rays don’t have fangs (teeth), horns, or spikes, making them completely harmless sea creatures. 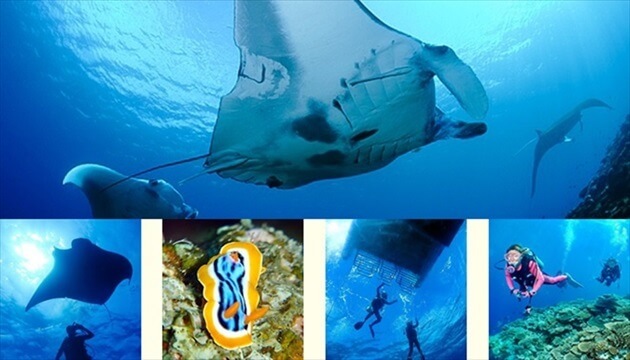 In Ishigaki, there is a spot called manta scramble. If you’re lucky, you can see manta rays dancing wildly from up-close. Stingrays have stingers on their tail, so be careful. 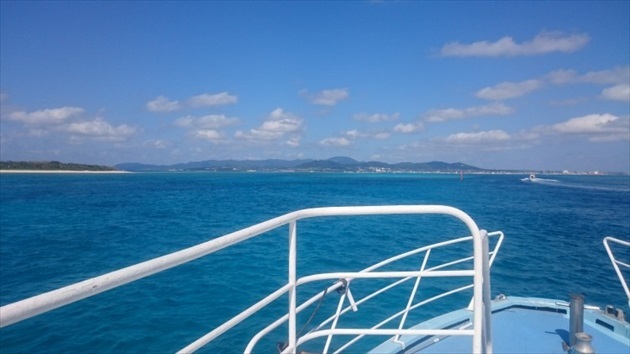 A great point about Ishigaki is that you can go on an expedition to the Yaeyama islands as a day trip. 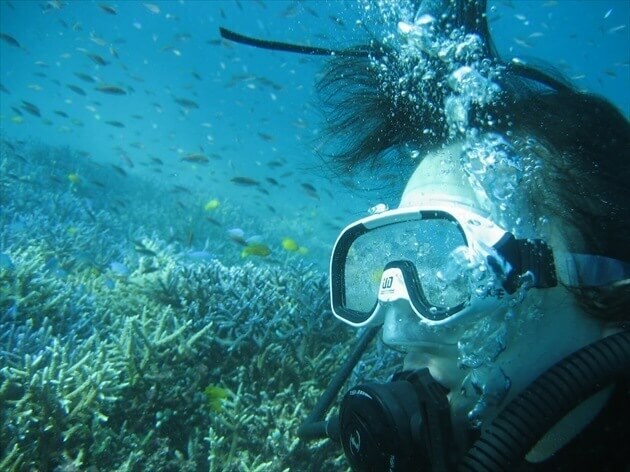 By riding on the diving tour company’s boat, it is possible to indulge in diving all day long. The outlines of the fish are pretty dark, so the sight of seeing other fishes swimming in large groups can be pretty overwhelming! While they walk pretty slowly, they are pretty fast swimmers when they are in the water! 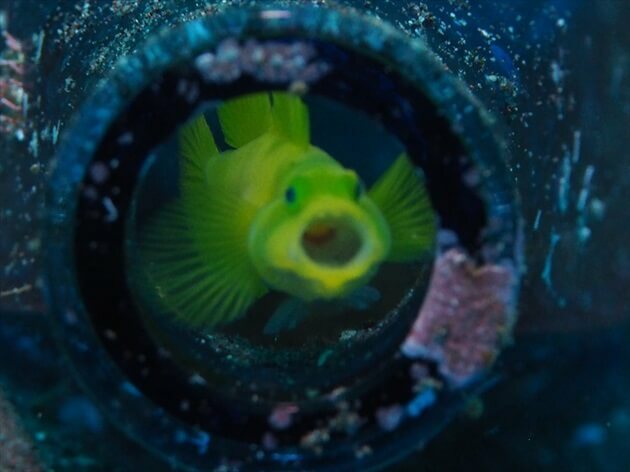 You’ll be introduced to the writer’s top three recommended diving shops, among the several existing in Ishigaki. all kinds of marine sports, night safari, etc. It is perfect for those who want to have marine fun all day long. 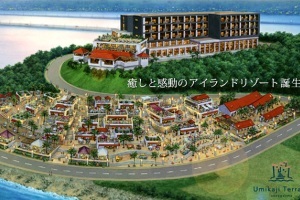 With Punushima, you can go to Manta Scramble, a diving spot where almost all the companies stop by. April to October tends to be the best time to see a jamboree of manta rays. For those planning a trip sometime in the summer or autumn, do look into it! refraction related to water and sunlight can make everything look bigger. Since it is all limited to small groups, you’ll get elaborate explanations and instructions. With professional instructors accompanying you, even beginners can feel at ease. 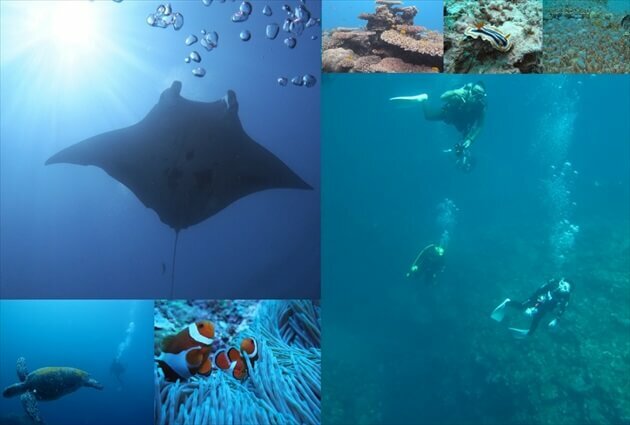 There are still only a few companies that let you do such a variety of things, as well as diving. 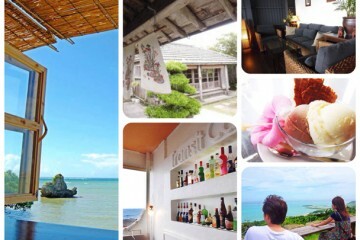 Enjoy Ishigaki to your hearts content with the cheerful staff members! Sea Friends is a company with a lovely homely vibe, run by a parent and child. 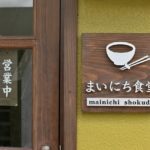 The owner is a light-hearted man, who actually pioneered diving spots such as Ishizaki Manta Scramble or Osaki Hanagoi reef. He is also quite the skilled photographer; he even won the first prize in several photo contests. It is very reassuring to be with someone who is so familiar with Ishigaki. That is exactly why I want to recommend topographic diving. 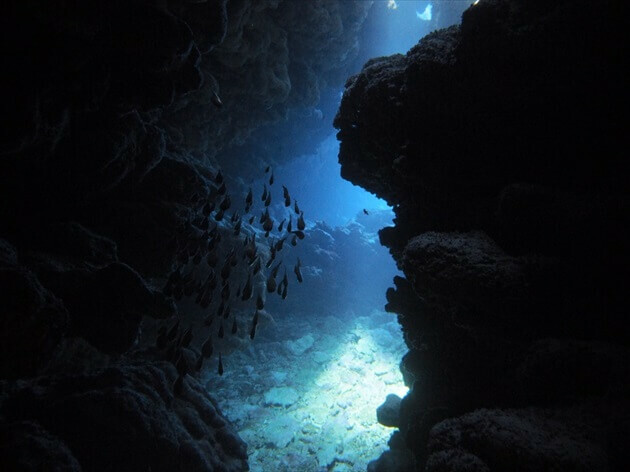 Reef edges or precipices are highly intricate underwater, so topographic diving means diving into crevasses (cracks in rocks) and such places. 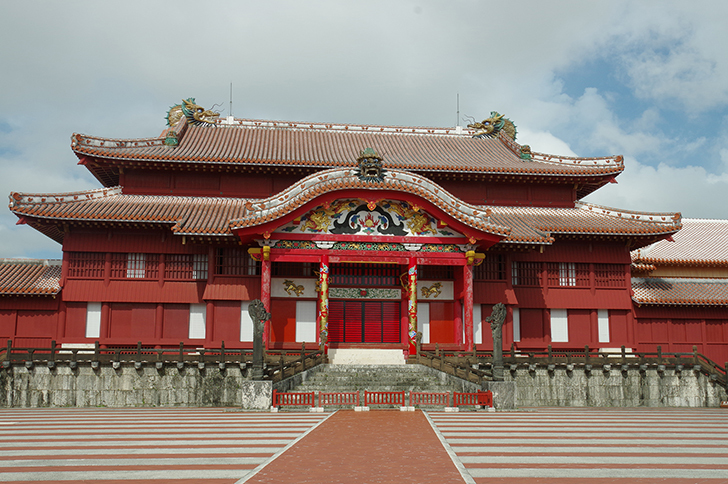 The most famous in Ishigaki is “Sakieda maze”. Living up to its name, you can dive in to the maze-like cracks, going to entrance of caves or entering holes and such; it’s an amazing line-up. Here, they also provide warm and courteous services for those with children. 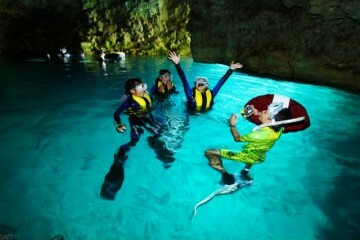 With the ‘wanpaku kids service’, the staff member takes care of the children while the parents are diving. Those with children from 3 years of age until elementary school age are eligible for this service. It is definitely a service to be grateful about. Have fun in the sea while the waters are calm! Because there are life jackets available for children, you don’t have to worry about the feet not touching water. There are also various other activities, such as fishing. 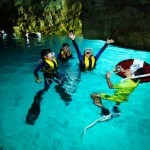 From families to serious divers, they have a wide variety of courses catering to each individual. They, of course, have a Manta Point package. 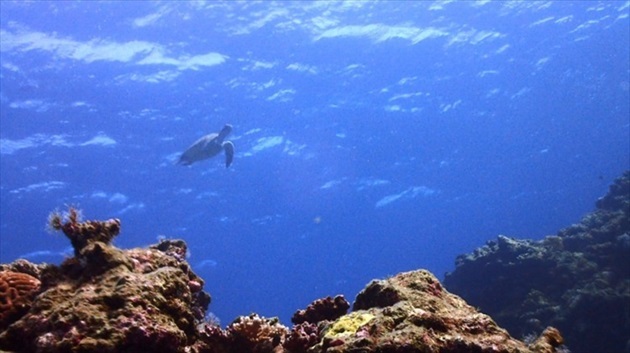 They can help you pick the diving spots you want to visit. 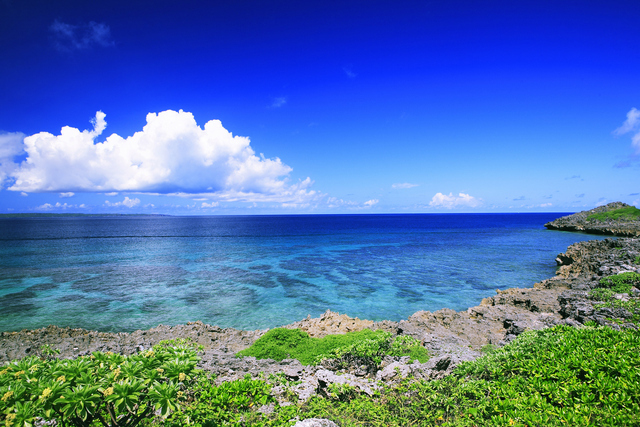 Marea Ishigaki supports the idea of fully enjoying Ishigaki Island’s great natures—the land and the sea. 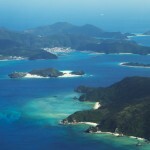 Of course, Marea Ishigaki covers the major diving spots for manta rays, dogtooth tunas, napoleon fish, bigeye kingfish. 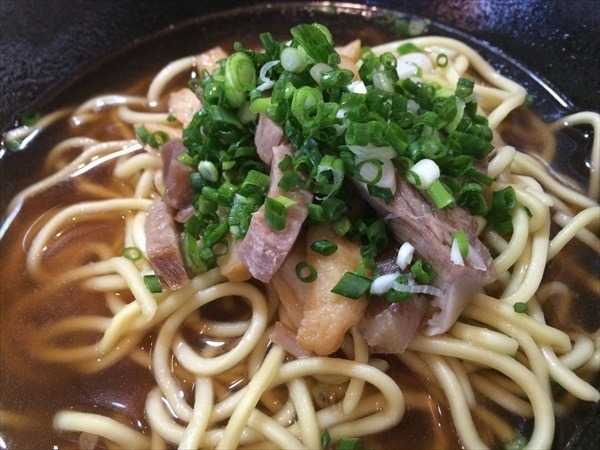 It is recommended for those who want to add an expedition to their trip. 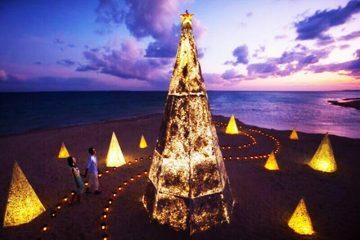 This company specializes not only in Ishigaki, but also in expeditions. 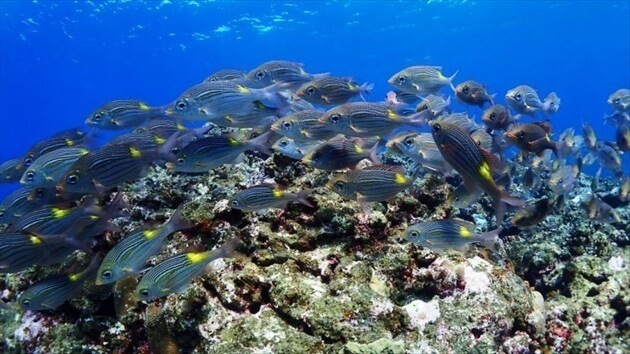 In terms of nearby places, you can go for a dive in the south part of the neighboring island, Taketomi Island, to observe shoals of tuna, for example. 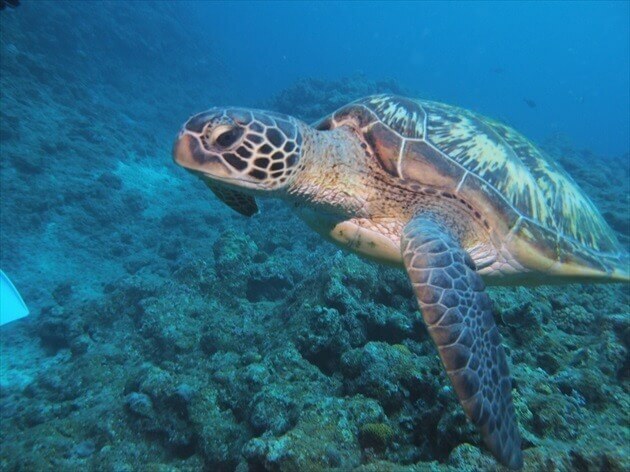 Further ahead, you can go to Kuroshima Island to search for sea turtles or manta rays. 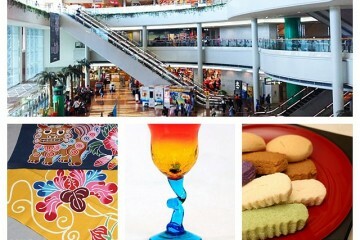 They have a wide variety of courses such as these. If you just want to go diving, it is the place you would want to go as much possible for the for the duration of your trip. Another key point is that they are truly considerate about the participants feelings. Rather than just the existing courses, there is a warm thoughtfulness behind them. For example, for those that love natural features, they’ll be considerate enough to let you stay as long as possible in nice spots, or for those who want to lazily swim with colorful little fish, they’ll let you take your time doing that. Their motto is ‘Have fun, with safety’ and they recommend taking courses to fit each individuals’ pace. The staff members are also honest and extremely kind, so you’ll even be safe alone. 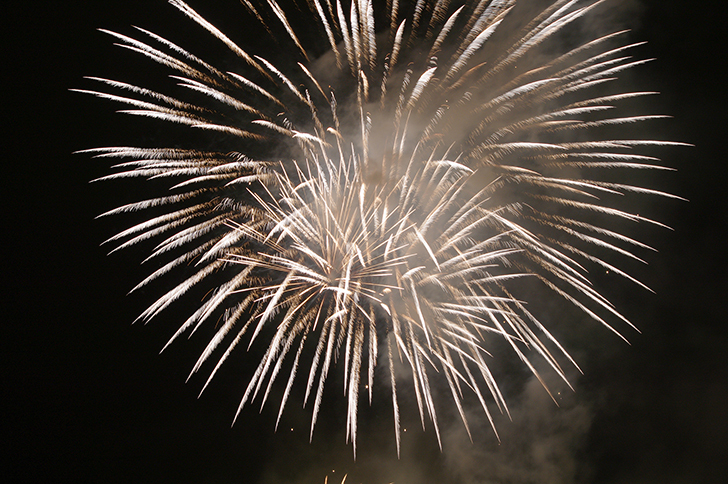 With their strong support, make some memories to last a lifetime! 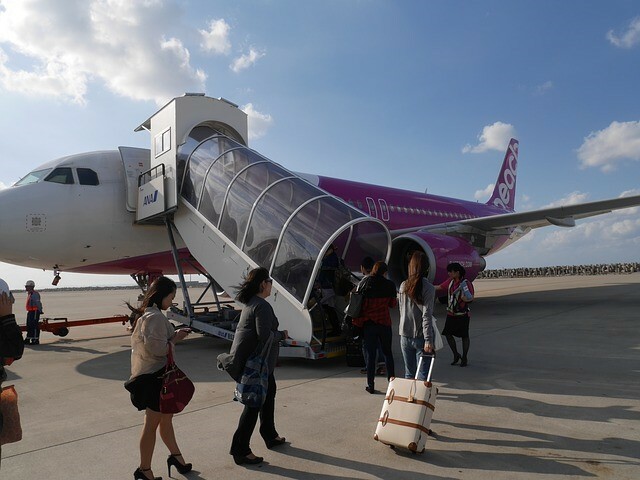 If you’re traveling by plane from Tokyo or Osaka, it will be pretty expensive. If you search for ‘Ishigaki Island, discount airline tickets’, you’ll get a large number of results. One method is to use a price comparison website that will appear among the results. For example, sites such as Travel.jp or sky-scanner are pretty famous. 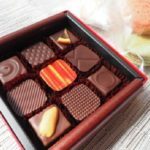 Another effective alternative to discount airline tickets, as explained above, is to book a package tour that includes the diving cost. Another merit is that, in terms of booking diving tours, it is much easier than booking them separately. 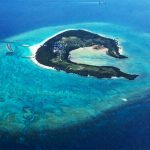 There are many articles that introduce the tourist spots on land part of Ishigaki Island, however, there are many attractive spots below the island as well. 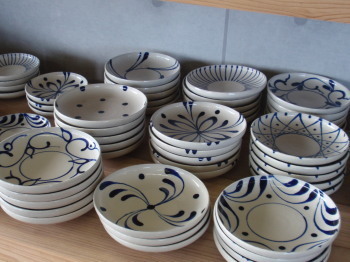 It is possible to rent the equipments necessary for diving in every shop. A great plus point is that you can take a trip there with barely any luggage. When you are diving, make sure you listen to the instructions carefully and follow the rules. 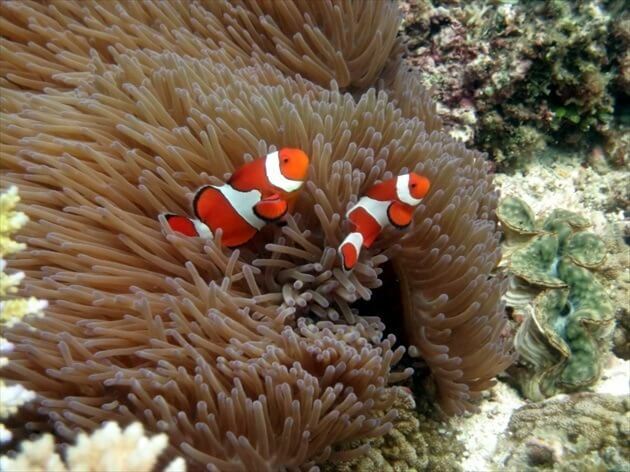 Look at the amazing views underwater and enjoy diving to your hearts content! 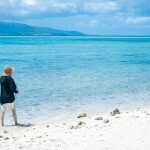 Let A Travel Agent Tell You: How to Have Fun in the Kerama Islands!